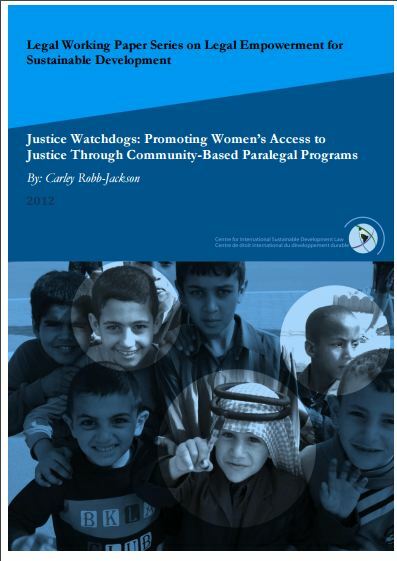 This week’s featured resource is the report Justice Watchdogs: Promoting Women’s Access to Justice through Community-Based Paralegal Programs by Carly Robb-Jackson. Within conflict-affected states, rule of law reforms have typically centered on building the capacity and legitimacy of state and formal institutions, and only address citizens‟ justice experiences and needs at a cursory level. Recently, there has been recognition of the need to consider individuals in the reform process, and this awareness has led to a transition from primarily top-down institutional reforms towards those which include bottom-up interventions. This increased focus on bottom-up interventions is accompanied by an emphasis on access to justice and a strategy of legal empowerment. Within the context of Sierra Leone, rule of law and justice programming began with a primarily institutional and formal approach, and these interventions were found to overlook many of citizens‟ most immediate legal needs. As a result, new forms of programming were developed which took those needs as their starting point, with community-based paralegal programs as one strategy. Despite the significant development and rapid growth of these programs, they have received scant attention within the literature, and insufficient research exists on the linkages between these programs and women‟s access to justice. There is a particular need to assess the gendered impacts of these programs, especially as donor support to user-based approaches to justice continues to increase. This paper seeks to fill this gap, by exploring the effects of community-based paralegal programs through a case study on Sierra Leone, and makes a contribution to the field of gender and law. Further, this case study is particularly well-timed as Sierra Leone moves towards its Presidential elections, to be held in November 2012, and parliament considers a draft Legal Aid Bill. As always, please let us know your thoughts on this resource or if you have any questions for the authors by commenting below. The Featured Resource is a short profile of a key resource found in the resource library of the Global Legal Empowerment Network. These resources can be older or brand new, but they all touch on important themes within legal empowerment. If you have a resource you would like to profile with the network, upload it directly at this link or email it to community@namati.org. We should consider building capacity of rural and slum to be paralegal agents of access to justice. Over 60% of slum widows were forcely evicted from their homes after the loss of their husbands. This women are denined their rights due to selffish intrest of their husband kings men. We currently working League of Extraordinary Widows to short change the vice, as we lobby for women seat in the Council of Elders at the grassroot level. Its time to take the fight back to the oppessor. Women being disinherited unfortunately is entrenched within rural communities globally and more so in Kenya where there is no representation for them in these structures. It is sad that years after they have lost their husbands someone can walk in and claim their inheritance (property) which they claim had been sold to them for peanuts or even promised to them without even being challenged. The paralegal approach is certainly one to consider in bringing together these issues of empowerment of disenfranchised groups and addressing long-standing issues on land and property ownership. The matrimonial property act of Kenya 2013 (albeit having loopholes) should provide safeguards and more people need to be systemically empowered on it and there has also been progressive jurisprudence like the landmark ruling by Justice Lucy Waithaka in February 2019 through the Environment and Land court in Nyeri County ruling that married women qualify to inherit properties that belong to their father this was against the grain of women being disinherited once they were married.